Personalize your PC with your choice of color. Whether you're a professional looking for a heavy-duty PC to keep up with a demanding workload or an avid gamer seeking out breathtaking visuals and responsiveness, HP® has the solution. Step up your game and revolutionize your desktop PC setup with style and performance at the forefront. The HP Pavilion tower is an incredible addition to your workstation or gaming space with a wealth of features and customizations designed to ensure one of the best experiences available. With a selection of bold, modern styles that grab your attention and a full suite of top-of-the-line processors, graphics cards, and memory, you'll be above and beyond the rest as you discover a whole new world of possibilities. 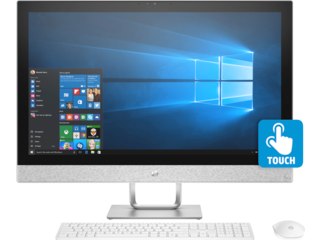 With a variety of styles and options available in the HP Pavilion family, you can find the desktop best suited to your needs. 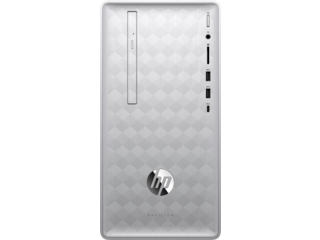 The base model HP Pavilion Desktop comes standard with a Windows 10 Home 64 operating system and AMD Dual-Core A-Series processor, making it easy to snap between projects, run the latest programs, and give an overall boost to your organization and productivity. Optimize your workload with features designed to make work easier. AMD Radeon™ R5 Graphics make every project stand out and 1TB of storage ensures that you always have enough space for even large-format files. Also, you can easily upgrade and expand your functionality with multi-display connectivity. Say goodbye to the days of bulky towers cluttering your workstation. The HP Pavilion tower is designed to pack serious power in a frame as compact and space-saving as possible. And with several color options available, you can bring a personal flair to your workstation. At an incredible price, there's never been a better time to reinvent your home or work office with the HP Pavilion computer tower. Casual gamers, professional competitors, and streamers alike will find something to enjoy in the latest innovation of gaming PCs. The HP Pavilion Gaming Desktop is packed with the power you need to soar above the competition and get exceptional results. 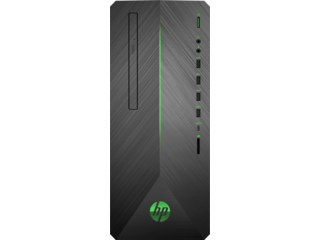 Boasting a black, angular metallic frame with green accent lighting that demands attention, the HP Pavilion computer tower makes your gaming rig shine on the outside, too. With the performance of an 8th Generation Intel® Core™ i5 or i7 processor and the incomparable visuals produced by NVIDIA® GeForce® GTX 1050, 1060, or 1070 graphics, you'll get consistently solid framerates and outstanding graphical fidelity. Games take up an increasingly large amount of space, but with up to 2TB of storage, you can keep your library packed with all your favorite games and continue to expand it. No more compromising on which games to keep and which to uninstall to make room for more. Stay up-to-date on the latest triple-A (AAA) games with a desktop designed to keep up with your demands while adding a newfound style to your station. 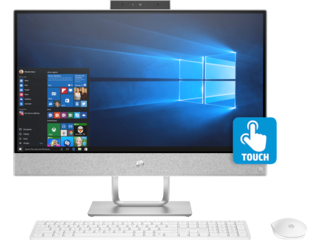 The perfect solution for reception desks, office settings, or home offices short on space, the HP Pavilion 27 All-in-One combines the power of an HP Pavilion tower with a stunning, high-resolution edge-to-edge display in one stylish and minimalist package. Ideal for streaming videos, video conferencing, and much more, the Full High Definition (FHD) display with optional touch features makes every image burst with outstanding detail. An Intel® Core™ i5 or i7 processor gives you the power you need to get you through your workload or leisure time. With major storage options, performance power, and a striking, streamlined design, this desktop is ready-made for radically improving your desktop experience. Whether you're turning out projects, seeking out that top spot in a battle royale, or just looking for an upgrade to your current desktop, there's a solution for you in the HP Pavilion family. Built from the ground up with style, personality, and incredible power in mind, this series’ computers offer major benefits to users of all kinds. Turn your home or office into a pinnacle of productivity with the HP Pavilion, which is changing the desktop game with its options suited for work, play, and everything in-between.